Shortfill or Shake n’ Vape e-liquids are larger bottles of vape juice that come without nicotine. These e-liquid bottles are called shortfills simply because they are not filled to the top! The space at the top is for adding a nicotine shot (or ‘nic shot’) – usually a high nicotine strength, unflavoured e-liquid. Once this is added, you shake the bottle to mix the nic shot with the flavoured e-liquid (hence their alternative name, Shake n’ Vape). The word shortfill is more commonly used than Shake n’ Vape, at least in the UK. Prior to new vape regulations which came into effect in May 2017, many vapers bought larger bottles of vape juice. However, the EU introduced a limit on the size of nicotine containing e-liquid in the convoluted compromise that was the Tobacco Products Directive. Crucially, the limit was on nicotine containing e-liquids, not nicotine free e-liquids. There remained an immense and frustrated demand for larger e-liquid bottles. One problem is price. It’s far cheaper to produce larger bottles than it is to produce smaller bottles, and that price gets passed on to vapers. This doesn’t matter too much for vapers using lower powered devices, but cloud chasers who use high powered devices can consume an immense amount of e-liquid in a short time. It’s also frankly frustrating to have 5, 10 or even 20 bottles of e-liquid knocking round instead of one large bottle. Finally, many vapers also feel that smaller bottles lead to more plastic waste and are harmful to the environment. Enter shortfills. By separating the nicotine from the e-liquid, manufacturers were once again able to produce the larger bottles of e-liquid that vapers were demanding. You still need to buy nicotine shots separately, but in some ways it’s definitely a step forward for vapers. Initially, shortfills were often of very poor quality. In fact, we independently tested a number of brands in the early days and were unable to find any which matched our standards. Why? Well EU regulations requires nicotine e-liquids be tested. Most of the better suppliers were doing this anyway, but new regulations extended this across the industry, and initially there was great hope this would strip out cowboy suppliers. At least until shortfills came along, managing to slip through the net of regulatory testing thanks to their zero nicotine content. 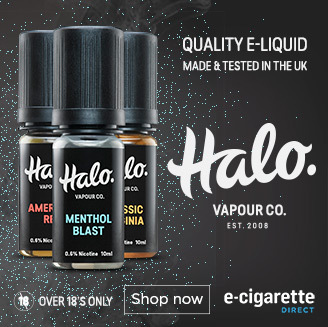 The market has since developed, and there are an increasing number of high quality shortfills available now which undergo the same testing as 10ml e-liquids. Unfortunately, there’s also still some rubbish around. There’s a danger that these could undermine the reputation of the industry, and it’s likely some less informed vapers are buying shortfills which are not as safe as they could be. Ideally, we’ll eventually see some sensible regulation that requires testing without adding ridiculous size limitations. But don’t hold your breath 😉 In the meantime, we suggest buying your shortfills from suppliers you trust. So now you know what shortfills are all about, you’re ready to get them? Hold fire – shortfills are not for everyone! Shortfills usually consist of high VG e-liquids. These aren’t great for coils with high resistance. That’s because the thicker e-liquids burns out these coils. High VG e-liquids are designed for cloud chasers who use low resistance coils with larger port holes designed to handle the thickness of e-liquids. They’re also not great for people who prefer stronger nicotine levels. Because EU regulations still apply to nicotine shots, the maximum strength allowed in nicotine shots is 2% (20mg). 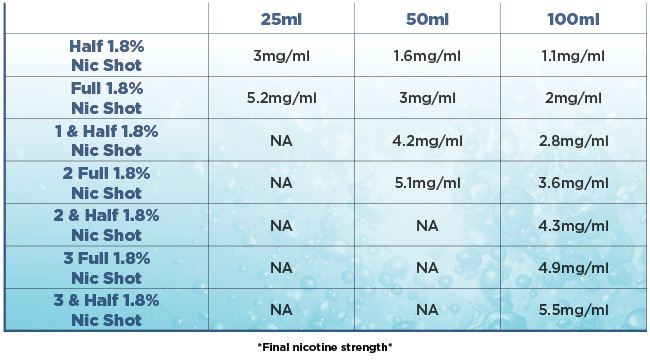 If you add a full nic shot to 50ml of flavoured e-liquid, you’ll still end up with a relatively low nicotine level. For more powerful devices this isn’t such a big deal, but for starter devices the nicotine hit can be very poor. If you’re a cloud chaser with an advanced device, great. The high VG levels are perfect for blowing clouds, the larger quantity is great for devices that use more juice. However, if you prefer a tight draw, a good throat hit and smaller clouds of vaper – the type produced with a low powered device couple with a high resistance coil – you’re probably better off sticking with 10ml e-liquids. Fortunately, using shortfills isn’t rocket science. Simply remove the top of the shortfill bottle, add your nicotine shot/s and shake vigorously before use. How much nicotine should you add? To help you calculate the nicotine levels you need, we’ve put together this simple calculator. Bear in mind that because of the maximum level of nicotine in shortfills, there are limits on the nicotine strength you can get. Also, if you add too much nicotine then you’re going to lose the flavour of the shortfills. Read enough, and ready to try some for yourself? Then why not check out the delicious shortfills available here! In America, we may need this method for flavor, not nicotine. 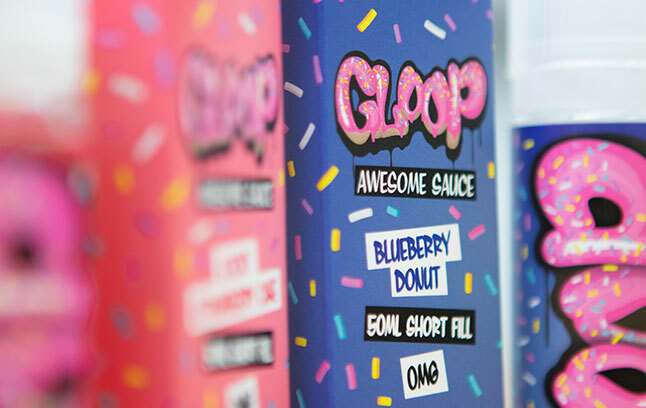 There’s talk that if the FDA bans flavored ejuice as too kid-friendly, we’ll buy unflavored nicotine ejuice & a separate bottle of flavors of your choice to shake & vape. Flavor Concentrates are already on the market as an easy way to DIY your own ejuice. I made some Cinnamon Roll ejuice, with all the flavorings premixed in 1 bottle. I hope you Americans can find a work around! The danger is that flavour shots could have flavour constituents that are not tested and are not appropriate for vaping. One good thing about the regulation in the EU is that (at least with 10mls) there is a lot of testing go on. Along with research being carried out into flavour constituents, that means e-liquid here is getting better and safer. The regulations don’t apply to short-fills but the better companies are utilising that research too. I don’t know what the situation is in the USA, but I suspect that the aggressive attitude of the FDA means there is not enough focus on improving the safety profile of e-liquid.